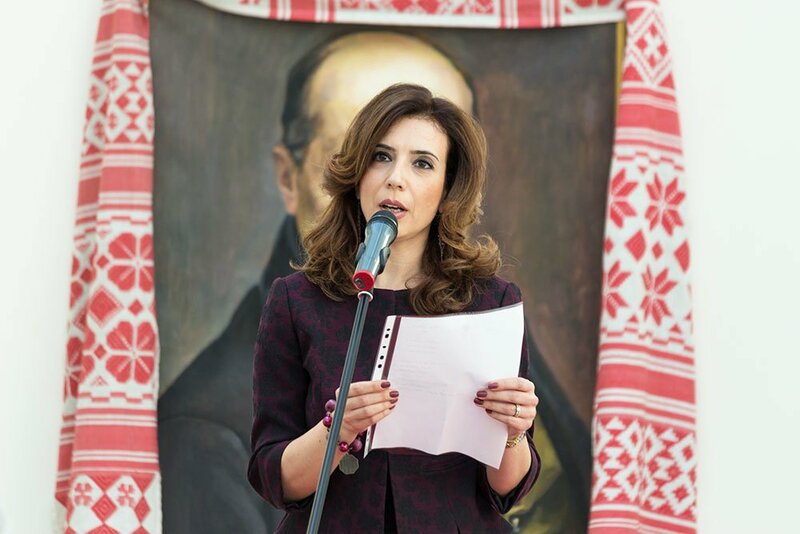 Candidate of Philology, Head of the Media Center of the State Enterprise "Directorate-General for Rendering Services to Diplomatic Missions", scientific secretary of the "Scientific Society for the History of Diplomacy and International Relations". The preservation, research and development of culture is impossible without studying the language code of the nation, the role of language as a form of expression of culture and the means of its formation. The language determines the ethnic identity of the carriers of culture. 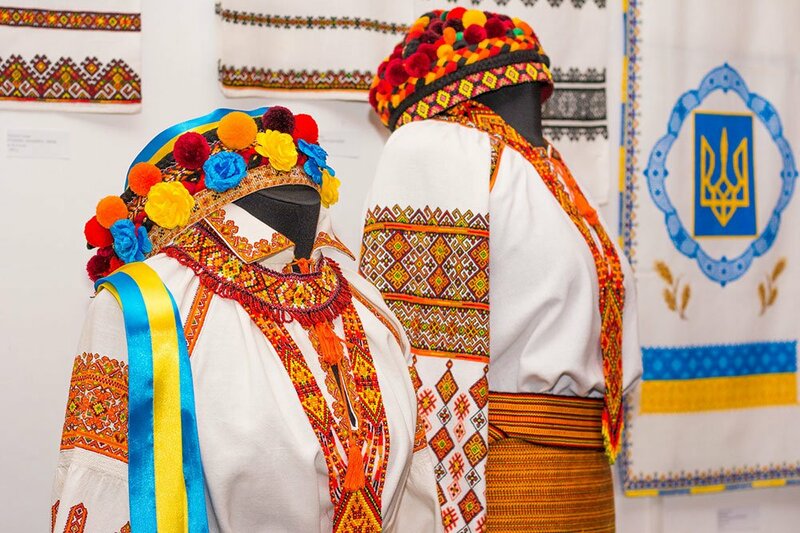 It is an important factor in national development and the carrier of the intangible heritage of each nation, because it reflects ethno-cultural, psychological and mythological ideas and experiences. That is why the language was introduced into the UNESCO Convention for the Safeguarding of Intangible Cultural Heritage, adopted in 2003. «Nations do not die from a heart attack. At first, they are getting deprived of their language». The ideas of Humboldt, Benveniste and Potebnja remain valid in the modern linguistic world. Scientists claimed that language is primarily a spiritual essence, the inner world of a man, a unique creation of an ethnic group. 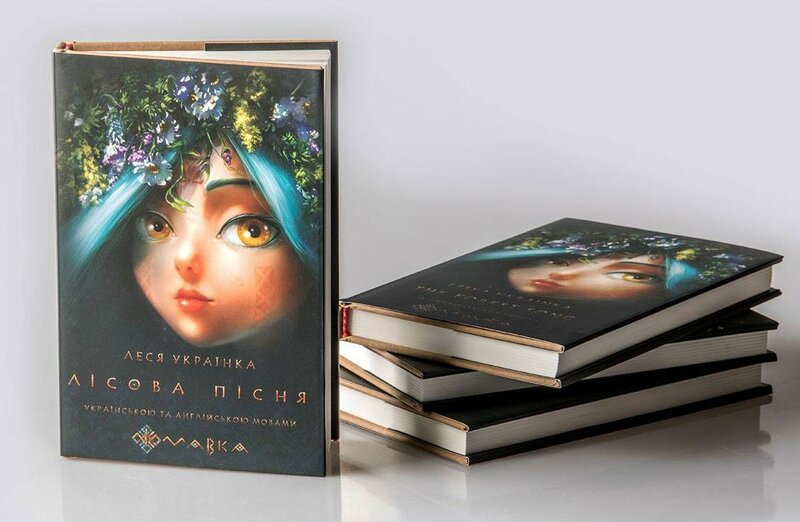 Today these ideas acquire special acuteness due to the need to attract attention to the problem of language assimilation and oppression that the Ukrainian language has been experiencing for centuries. Archetypes, culturally important concepts as the codes of the nation recorded in the mental and linguistic consciousness of people, allow the nation to store and broadcast elements that capture information for subsequent generations, forming ethnic unity and identity. 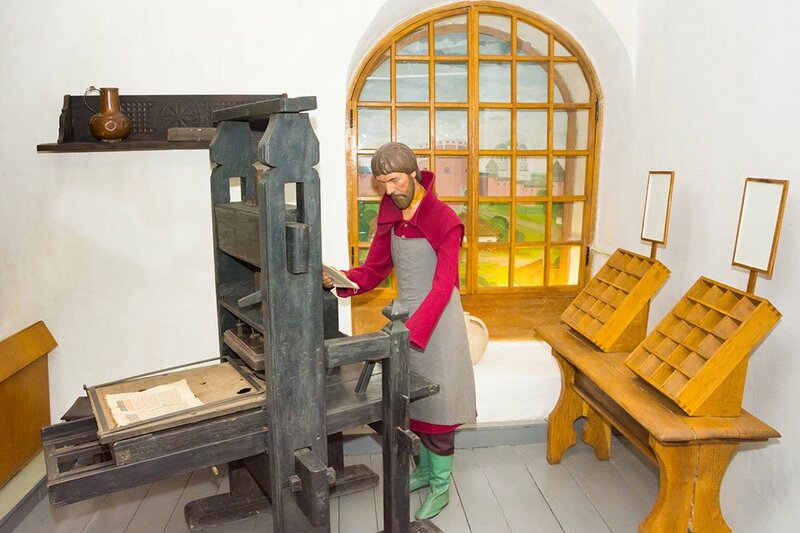 The very language preserves culturally important national information and is the key to understanding "psychology of the nation" (the term by Oleksandr Potebnja). Language is a dynamic system, the parts of which are in constant motion, change and development. The process of its formation and improvement never stops. At the same time, it retains the signs of stability and integrity. External factors, as well as intercultural interaction, can affect the language positively enriching it. This influence is not always mediated. It can be done in order to destroy national identity. The language, being not only one of the instruments of categorization and conceptualization, but also in general the method of intellectual comprehension of reality, reflects the signs of the formation, development of the nation, peculiarities of thinking and adaptation to the external environment: geographical, climatic, historical, religious, etc. Precisely because a language is a natural substrate of culture, an instrument of mental ordering the world, a means of fixing ethnic perception of the world and optimizing intercultural interaction, a language is the first to be destroyed during the policy of forced assimilation. 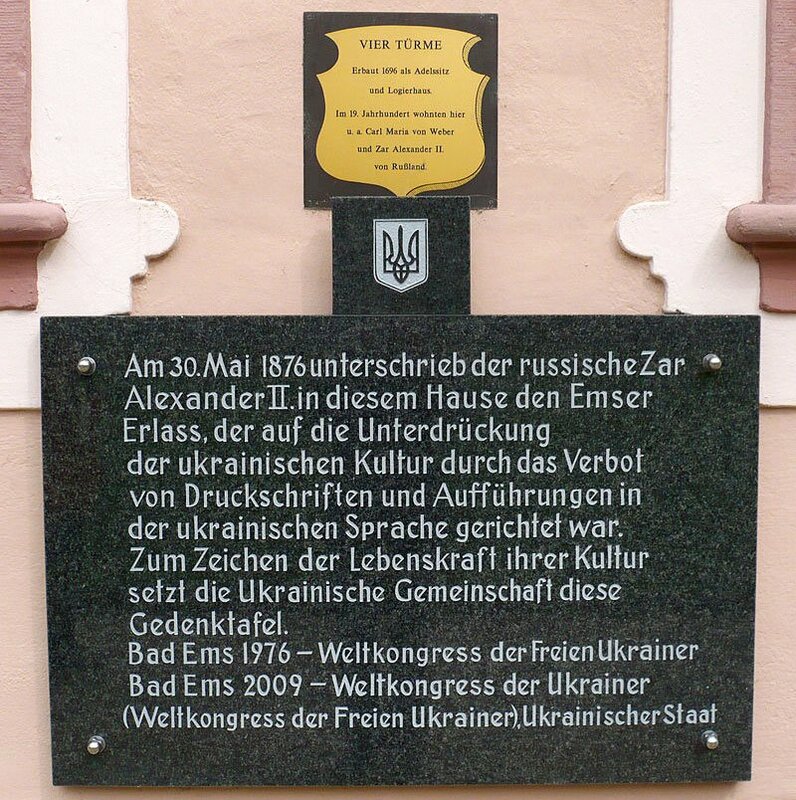 A memorial plaque devoted to the "Ems decree" installed in the city of Bad-Ems at the house "Haus Vier Türme"
Language assimilation is defined in the encyclopedic discourse as the loss of "the own language by a person, an ethnic group or a people, and the transition to the language of the other people, as well as the loss of the original features of the language under the influence of the ruling nation`s language." 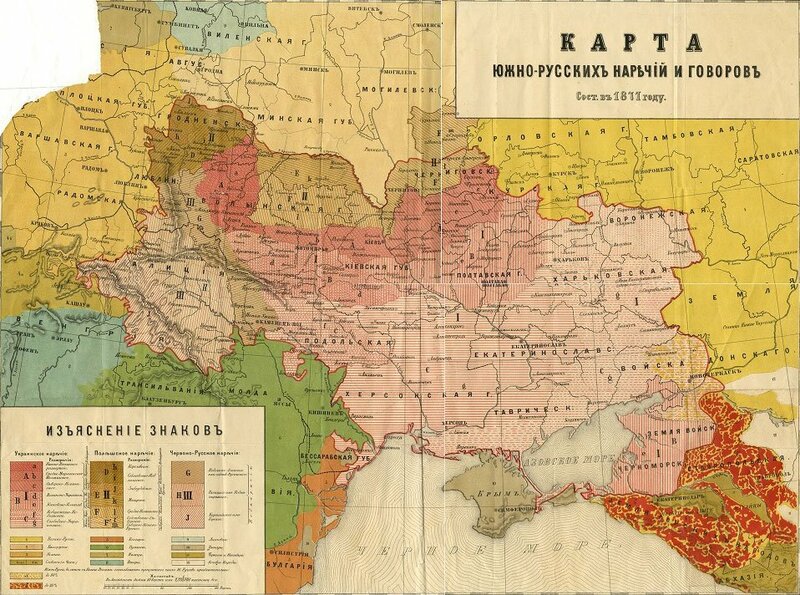 In the Russian Empire, which traditions were inherited by the USSR, the oral and written Ukrainian language was banned. 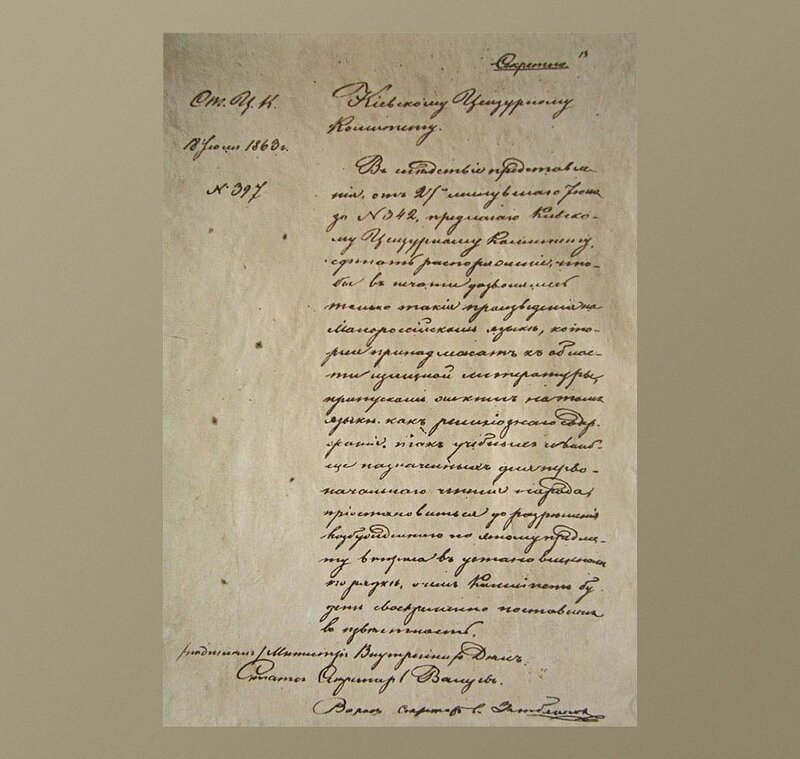 Since the time of Ukraine's annexation to Russia (1654) and the fall of the empire (1917), many decrees, circulars, acts with various forms of prohibition of the Ukrainian language have been issued. Their chronology is a few pages, but the whole era of linguistic genocide, the executed dynasties, and tortured human fates are stretched behind them. 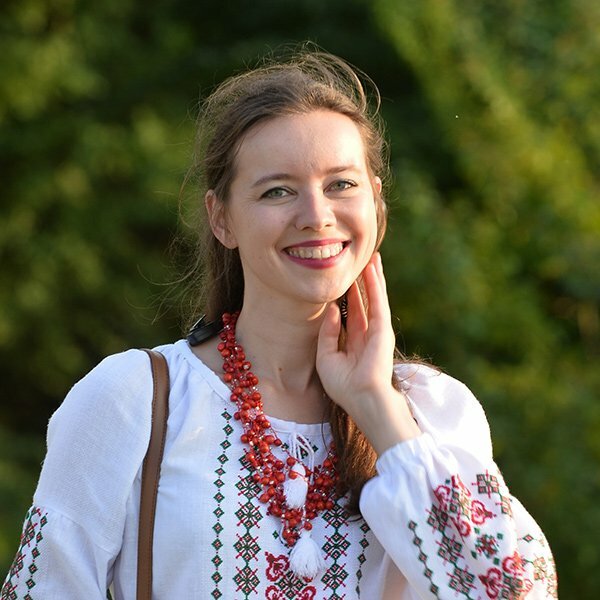 The Ukrainian language is still under the pressure of Russification because of centuries of assimilation and the current political situation. 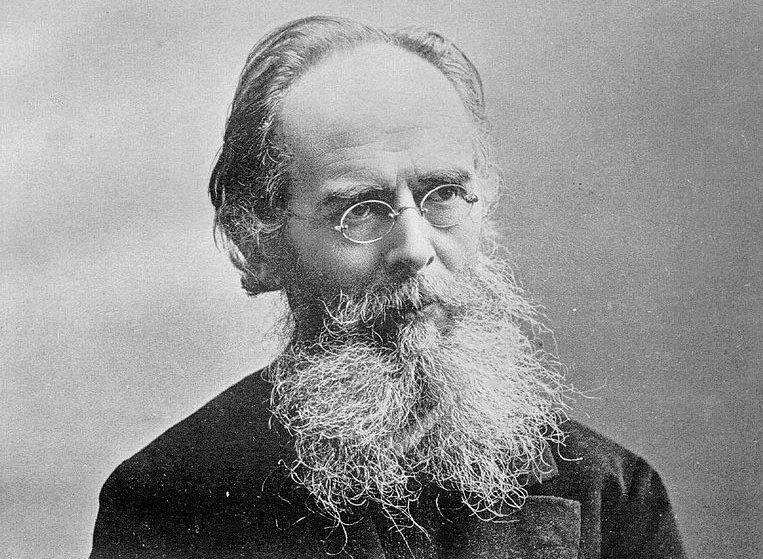 Significant negative influence on language was caused not only by the external prohibition, but also by the internal assimilation of the structure of the language (George Yurii Shevelov): banning of original Ukrainian words and syntactic constructions and the their substitution with new versions, close to Russian ones, with their subsequent complete replacement. 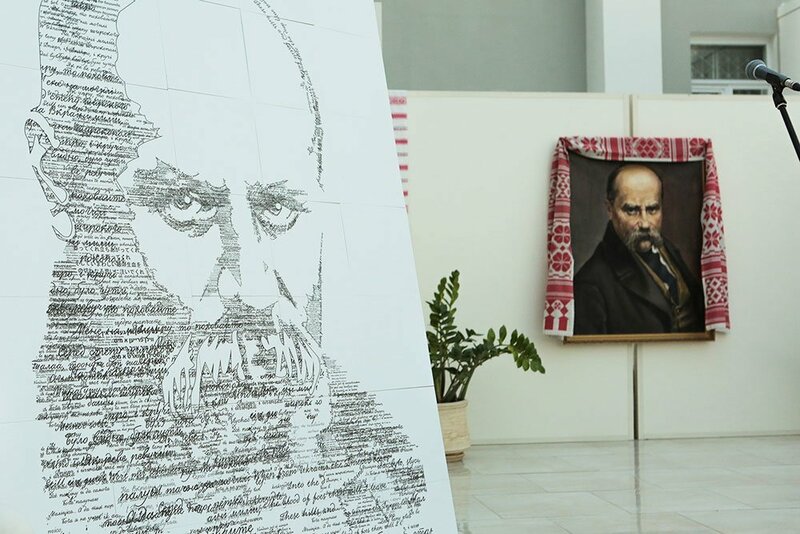 The development of any sphere in Ukraine is impossible without the national revival of culture, the basis of which is the development of the Ukrainian language. The policy of linguistic assimilation affects the demoralization of the national consciousness, the reduction of the number of active carriers of the Ukrainian language in their territories, their separation from Ukrainian spirituality, history, their transformation into persons without national roots, indifferent to the state, as well as material and intangible heritage of the nation and its identity. 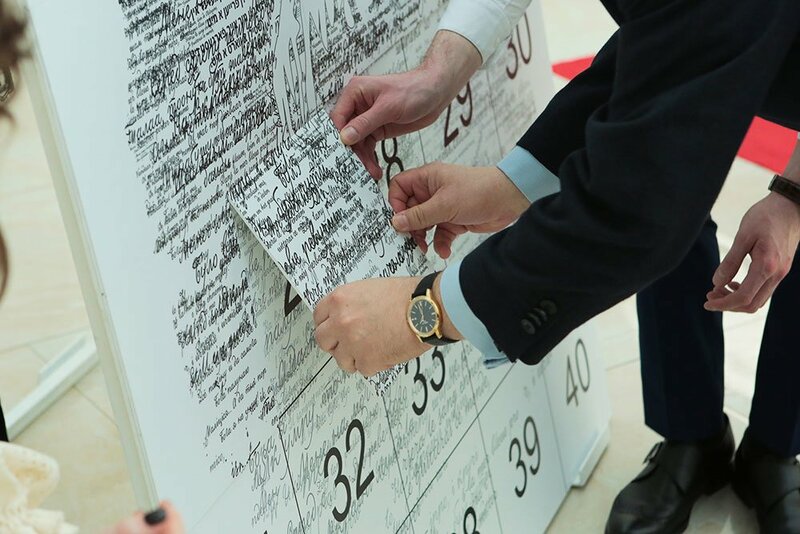 Considering language as an opportunity to preserve cultural diversity with intangible value, in 2009 UNESCO presented an electronic version of the "Lists of Endangered Languages", which includes 2,473 languages. Such languages` state varies according to six categories - from "safe" to "extinct". The languages of the ethnic groups of Ukraine appear on the lists of "under threat of extinction". the disappearing Nogai language, which is spoken by the Crimean Tatars. Since the language reflects the processes of formation of culture, its social varieties and international relations, the linguistic material is an irreplaceable source for studying the cultural development of the people. It is the true spirit of nation. It is the result of ethnic uniqueness. That is why language is the greatest value of every nation. Semchynsky S.V. General linguistics. K .: JSC "OKO", 1996. 416 pp. Potebnja O. Language. Nationality. Denationalization: articles and fragments; arrangement of and introduction. Art. Iu Sheveliov; Ukrainian Free Academy of Sciences in the USA. New York: [b. in. ], 1992. 155 pp: il. Shevelov Yurii. Ukrainian language in the 1st half of the 20th century (1900-1941): State and status // Library of the Prologue and Contemporaneity. 1987, p. 173. 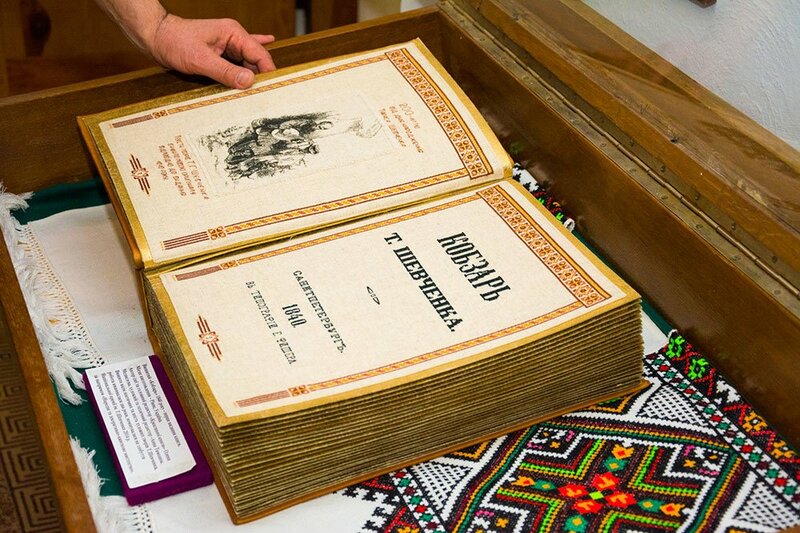 Ponomariov O. D. Encyclopedia of modern Ukraine. [Electronic resource].